A gray deck-gun at the Strandings Museum in Thorsminde bears silent witness to how close events of the First World War came to Denmark. When a German submarine, at the beginning of November, 1916 ran aground off Vrist on Jutland's west coast, the Danish Secretary of the Navy had no clue to the U-boat's true identity. Historical reports, written later, downplay the significance of the drama that took place just outside Danish territorial waters as the Germans and English struggled to decide the U-boats fate. Just inside the entrance to the museum in Thorsminde the sight of a gray deck-gun meets visitors. The gun in itself is unimpressive. The gun is a new addition. In 2001, the Royal Navy lent it to the museum. Since the end of the First World War, it had been on display at Holmen, the Royal Danish Navy's headquarters. If one has no particular interest in old deck-guns it is possible to pass by the display, without realizing that it played a major role in the First World War. The information-tablet, however, tells another story. The deck-gun is an 88 mm cannon, system Erhardt, model 1913, made by Rheinische Metall-warenfabrik in Düsseldorf, 1915. What makes precisely this deck-gun, series no. 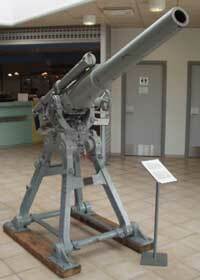 973, interesting is that until 1917, it was mounted on the German U-boat U20. The deck-gun from U20 seen here at the Strandings Museum in Thorsminde. The 230 foot long, diesel-powered U20 was not just another anonymous u-boat on patrol as a member of the Royal German High Sea Fleet. The U20 and its commander, Kapitänleutnant zur See Walter Schweiger, wrote themselves into world history on the morning of May 7, 1915. On that morning, the U20 launched a torpedo, its last one, towards a large ship 14 miles off the Irish coast. The ship was the well-known Cunard luxury liner R.M.S. LUSITANIA. The torpedo struck the ship slightly forward of the bridge on the starboard side and it sank in a mere 18 minutes in 310 feet of water. The U20's victim, Cunard liner R.M.S. LUSITANIA. The sinking of the LUSITANIA cost 1.198 lives, including 124 American citizens. It was one of the primary reasons the U.S.A. entered the First World War one and a half years later. When Schweiger gave the order to fire U20's last torpedo at the LUSITANIA, he was almost certainly unaware that it would sink the luxury liner. He was certainly even less aware of the act's political consequences. Criticism, however, was not unknown to Kapitänleutnant zur See Walter Schweiger and his crew. The U20 had, a few months earlier on February 1, 1915, fired at a hospital ship in the English Channel. The action had provoked wide scale international criticism. What did these historical events have to do with Thorsminde and Denmark's World War 1 policy of neutrality? Early in the morning of November 5, 1915, the Danish Secretary of the Navy received notice that a German U-boat had stranded off Vrist on the Jutland's west coast. The U-boat, being in Denmark's territorial waters, had thereby violated Danish neutrality. A Danish warship was sent immediately to the U-boats position to monitor the situation and possibly to protest the violation of neutrality. At this time, the Secretary of the Navy was unaware of the reason for the stranding and even less the identity of the German U-boat involved. The following days revealed not only the U-boat's identity, but also how close the war had come to Danish territorial waters. The U20 had been aiding another U-boat in a heavy fog when it ran aground off Vrist on the Danish west coast. Many tries to free the U20 failed and the boat sent a distress signal to the German navy's headquarters. Kapitänleutnant zur See Schweiger and his boat's reputation spurred the German Secretary of the Navy to launch a large rescue operation. A rescue ship and two battleships were sent to rescue and protect the U-boat and its crew despite the violation of Danish neutrality. English forces had been monitoring the German radio-frequence and were following the German rescue action. A British submarine was immediately ordered to the area of the stranding. The German battleship KRONPRINZ WILHELM was torpedoed by a British submarine. torpedoing the German battleship KRONPRINZ WILHELM, while it was protecting the U20. The torpedoed battleship was forced to leave the area immediately to seek repairs. The commander of the U20 realized the chances of rescuing the boat were small. To prevent its falling into enemy hands he made the decision to destroy it. The demolished German U20 on the beach close to Vrist. After the rescue of the crew one of the U-boat’s torpedoes was set to explode inside the U20. The following explosion was so powerful, that wreckage landed up to a mile away from the beach. Many of the Danes, who had watched the drama from the beach, were nearly blown over by the unexpected and powerful detonation. Others sought cover in the tall beach grass. The U20 had carried out its last mission. Kapitänleutnant zur See Walter Schweiger, commander of the U20, was born 7 April 1885. He was baptized Walter von Schweiger, but had chosen not to use the "von". The U20 was his first U-boat command and after avoiding internment in Denmark, he received, in April 1917, the command of U88, a slightly larger U-boat. On July 30, 1917, he was awarded Germany's highest decoration for bravery the "Pour Le Merite" for having sunk more than 160,000 tons Allied shipping. Schweiger was only the eighth U-boat commander to receive this distinction during the First World War. In total he ranks as number 6 on the list of sunken allied tonnage. A true U-boat Ace. Oddly, however, the list does not mention the LUSITANIA. Just a few months later the end came for the U-boat commander. On September 5, 1917, the U88 exploded and sank while being hunted by the British auxiliary cruiser HMS STONECROP in the North Sea. The U88 had probably struck a mine. There were no survivors from the German U-boat. In 1917, the Secretary of the Navy decided to salvage all useful items from the wreck of the U20 which still lay close to the beach by Vrist. Instruments, copper tubing and the 88mm deck-gun were removed and taken to naval headquarters at Holmen in Copenhagen. At the end of the war in 1918, the decision was made to make the gun useless. For many years after that, it had its place as an exhibit in the Navy Museum's collection. The destruction of the German U-boat U20 took place in 1925 using 1,322 lbs of explosives. The Secretary of the Navy demanded the destruction of the wreck for safety purposes. In 1925, the Secretary of the Navy decided to remove the wreck of the U20 for reasons of navigation safety. With the help of 1,322 lbs. of explosives, the historical wreck was removed form surface of the sea. In 1916, the wreck of the U-boat was nearly on the beach. Today, due mostly to the receding coastline it is over 300 yards from land. However, at the Stranding Museum in Thorsminde, an 88mm deck-gun and many other effects from U20 witness a time when "The War to End All Wars" came dramatically close to our door. LUSITANIA OnLine - The home port of RMS Lusitania on the Internet. - No. 1 for information on the ship and her last Master, Captain W. T. Turner.